August 11, 2016 — Shaping the Tradability of U.S. Energy Efficiency: Outreach to Minnesota stakeholders on the National Energy Efficiency Registry (NEER). This webinar seeks to inform participants about the intended functionality, governance, and benefits of the NEER. 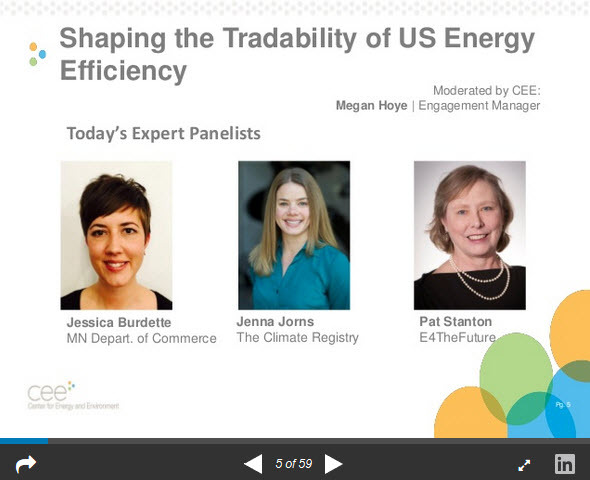 The Center for Energy and Environment hosted a webinar with Jessica Burdette, State Energy Office Manager at Minnesota Department of Commerce (COMM), Division of Energy Resources, Jenna Jorns, Policy Associate at The Climate Registry, and Pat Stanton, Director of E4TheFuture. Tennessee, five other states – Georgia, Michigan, Minnesota, Oregon, Pennsylvania – and partners The Climate Registry (TCR) and the National Association of State Energy Officials (NASEO) have secured a Department of Energy award to create the foundation for a National Energy Efficiency Registry (NEER). The NEER is a central repository that will allow the public and private sectors to transparently track energy efficiency attributes associated with energy efficiency programs and initiatives, as well as help demonstrate progress towards energy goals and potential compliance with existing and future state and federal environmental regulations. The NEER will also be able to track energy conservation and other types of reduction efforts. This future platform has the potential to catalyze new levels of voluntary public and private investment in energy efficiency.